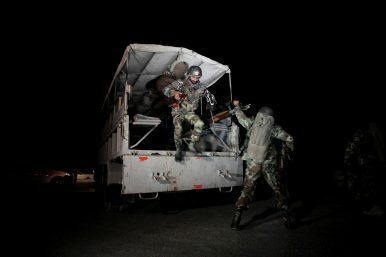 Pakistani troops deploy outside the Police Training Center after an attack on the center in Quetta, Pakistan (October 25, 2016). Is the Islamic State Now in Pakistan’s Balochistan Province? How the Middle Eastern terrorist group found a home in Pakistan’s restive province. Pakistan has been a hotbed of Islamic militants for years. Over 45 known terrorist and extremist organizations have sprung up or split off since the 1980s. The government, however, has continued to deny that the Islamic State (ISIS) is present in the country. Speaking in London last year, then-Chief of Army Staff General Raheel Sharif said “even a shadow of ISIS would not be allowed.” Senior officials in both Karachi and Punjab province have admitted, however, that their forces had carried out raids against ISIS militants. Now it seems that the government is admitting to the presence of ISIS after the military says it thwarted planned ISIS attacks on foreign embassies and the Islamabad airport, according to military spokesman Lieutenant General Asim Bajwa. The targeted killing of the president of the Balochistan Bar Association, Advocate Bilal Anwer Kasi, on August 8, 2016, marked the beginning of the self-proclaimed presence of the Islamic State in the province. When his body was brought to Civil Hospital Quetta, hundreds of lawyers gathered there to pay homage. That was when a suicide bomber struck, killing 63 of them. The total death toll that day was reported to be 93, with scores of others injured. This time responsibility was claimed by ISIS. It was the first, but not the last, devastating attack in Balochistan province claimed by this terrorist group, whose stronghold is in the Middle East. It was followed by two other major attacks – one on the Police Training Academy in Quetta, and the second on a Sufi shrine near Lasbela known as Shah Noorani. In these three attacks over four months, approximately 250 people were killed and more than 300 were injured. One might question why Balochistan has been selected for the expansionist policy of Islamic State into Pakistan. The answer is that Balochistan shares borders with Afghanistan and Iran on the west, and also borders the other provinces on the east. Suffering defeat and losing territory in the Middle East, ISIS sees Balochistan, with its rugged mountains, as a safe haven. Because of the porous border between Pakistan and Afghanistan, the newly established Islamic State could carry out attacks in both countries. The Afghan war sent approximately 3 million refugees to Balochistan. It would not be out of the question for ISIS to try to recruit these refugees to carry out terrorist activities. Also, while having a strong foothold in Pakistan’s Balochistan province, ISIS might easily expand to Iran’s Sistan Balochistan province. Iran is a Shia-majority state, which treats the Sunni with an iron hand. There is already an ongoing Sunni-backed movement that keeps attacking Iranian forces. Pakistani Balochistan and Iranian Balochistan share a boarder, so Pakistani Balochistan would be the logical point for ISIS to expand into Iran. The set-up for Islamic militants is already in place in the form of the madrassas in Balochistan, established to counter Baloch nationalists who fought the original annexation of Balochistan into Pakistan and the non-secular government that they have had to live under. Most of those religious schools in remote areas of Balochistan are already under the control of jihadi networks, and are also recruiting people. The same protocol given to the government forces to counter the nationalist movement could then be used against them by ISIS, just as the Taliban turned against the very forces which created them for the purpose of defeating the Soviet Union. However, countering an insurgent movement with a jihadi-sponsored movement has never been a smart move, and a disastrous policy in the long run as demonstrated by the insidious tactics of the Taliban. Strategically and geopolitically, Balochistan is very crucial as it shares borders with Afghanistan and Iran. Being the largest province of Pakistan by area, it is linked to all Pakistani provinces. For decades Balochistan has been witness to the Baloch national insurgency movement, calling for freedom from Pakistan. However, compared to the other provinces, Balochistan has been far removed from religious extremism. Sunni, Hindu, Shia, and Zikri (a group of Baloch people who believe that Mahdi will come back as a Prophet before end of the world) have all been living in peace and harmony without clashes, discrimination, and hatred. It is a known fact that the Sunni-Baloch and the Zikri-Baloch, despite different religious beliefs, often intermarry and respect one another’s religious practices. He added, “The Pakistan military supports Lashkar-e-Taiba because it fights India in Kashmir, but PML-N’s support leans more toward Lashkar-e-Jhangvi – not because they share the same ideology but because of a shared vote bank.” PML-N, or Pakistan Muslim League-Nawaz, is the ruling party of Prime Minister Nawaz Sharif. There have been more than 26,000 terrorist attacks since 2002 in Pakistan, according to security analyst Amir Rana. On the Capital TV talk show “Cross Check” on November 17, he remarked that ISIS had become a terrorist brand, attracting terrorists from all over the world. Host Awais Tauheed brought up the report by the Sindh Counterterrorism Department, which concluded that the central character in the recent attacks on Shah Noorani in Balochistan and Safoora Goth in Karachi was Shafiq Mengal, son of Balochistan’s former caretaker chief minister, Naseer Mengal. However, these attacks were also claimed by Islamic State. Does that mean Shafiq Mengal is now acting as ISIS? Jibran Nasir, a civil rights activist who has been one of the leading figures in the movement against cleric Abdul Aziz for refusing to condemn the terrorist attack on Army Public School in December 2014, says that while Pakistan has been denying the presence of ISIS, the truth is that the group does exist in Pakistan. It is not like that they are coming from the Middle East; they are recruiting the religious extremists within Pakistan. In one of his interviews, Abdul Aziz told TV journalist Saleem Safi that he is not involved in warfare; rather, he has been working on “ideology” – preaching the ideology of Islam. Aziz and his followers negate the idea of democracy. Instead they demand “Islamic Sharia.” And from this you have the makings of the potential ISIS recruit. Commenting on the recent win of Maulana Masroor Nawaz Jhangvi, son of slain Sipah-e-Sahaba founder Haq Nawaz Jhangvi, in the by-election for Punjab Assembly Constituency PP-78, Jibran said that a person involved in spreading hatred against the Shia sect of Muslims winning such an election is a defeat for Pakistan’s political process and justice system. A person who has been promoting intolerance and making hate speeches is now going to be a member of the Assembly. It will only serve to promote hatred, religious intolerance, and extremism in Pakistan; it will, indeed, be catastrophic. A few months ago, Lieutenant General Bajwa declared that Islamic States’ plans to expand into Pakistan had been foiled when four plotters were arrested in a raid in Lahore. But with the recent attacks in Balochistan, it seems that it has succeeded in securing the allegiance of some terrorist groups in Pakistan. Of the 20-point National Action Plan to crack down on terrorists which was established in January 2015 after the Peshawar school attack on December 16, 2014 killed 145, including 132 children, it is quite obvious that several key points have had no real results. There has been no signs of strict action against the literature, newspapers and magazines promoting hatred, extremism, sectarianism and intolerance; choking financing for terrorist and terrorist organizations; registration and regulation of religious seminaries; or completely dismantling the communication network of terrorists (points 5-8). Nor has the government actually implemented zero tolerance for militancy in Punjab (point 15) or dealt firmly with sectarian terrorists (point 18). If Pakistan is really serious about defeating ISIS and putting an end to other religious terrorist groups – and having the world take it seriously – it should consider a four-pronged approach. First, it must actually enforce the ban on identified terrorist groups, which has been in existence for four years. Second, it must target and eliminate the recruiting tactics of terrorist groups, which start with radical clerics preaching hatred to a naïve citizenry. Third, it must stop foreign funding of terrorist networks. So far Pakistan has not seriously addressed any of these critical tasks. Small wonder, then, that Islamic State has managed to secure a foothold in the country. Shah Meer Baloch is a former Visiting Fellow at the Institute for Peace Research and Security Policy at the University of Hamburg, a fellow of the Swedish Institute and the Institute for Foreign and Cultural Relations (Institut für Auslandsbeziehungen/IFA), and a freelance writer. He graduated from the National University of Modern Languages (NUML), Islamabad (Pakistan) in International Relations. His research focus is on Asia-Pacific politics, Balochistan issues, extremism and human rights. He is from Pasni, District Gwadar. CPEC and the Baloch InsurgencyTrouble at the Pakistan-Iran BorderThe Fallout From Pakistan's Nuclear TestsThe Rise of Religious Extremism in BalochistanIs Pakistan's National Action Plan Actually Working?